I've steered away from doing fan art for a long time due to copyright reasons. But I gave in and decided to make some for myself this year. I can't sell fan art so I can use it to experiment without having to worry about the outcome. As PLL season 7b is starting I thought it was a good time to make some Pretty Little Liars fan art. I started watching Pretty Little Liars, when the first season aired in Finland, but lost interest as season 2 rolled around. Then at the end of 2015 I randomly watched a few episodes I had saved in my digibox and got hooked again. I got all seasons 1-6 DVD sets from the library and watched them in the wrong order. I also made a note of interesting episodes I'd like to use for painting references. And these are the ones I chose. 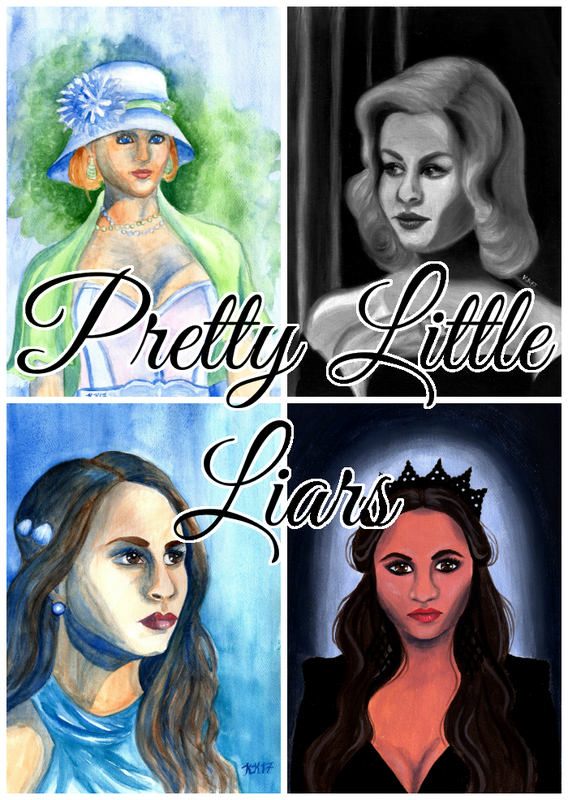 I painted Alison DiLaurentis from season 4 episode 19 Shadow Play, Emily Fields and Spencer Hastings from season 6 prom episode 9 Last Dance and Hanna Marin from season 4 Ravenswood Halloween Special episode 13 Grave New World. I was set on making four paintings and since I really wanted to paint Ali from the black and white episode, I unfortunately left Aria out. 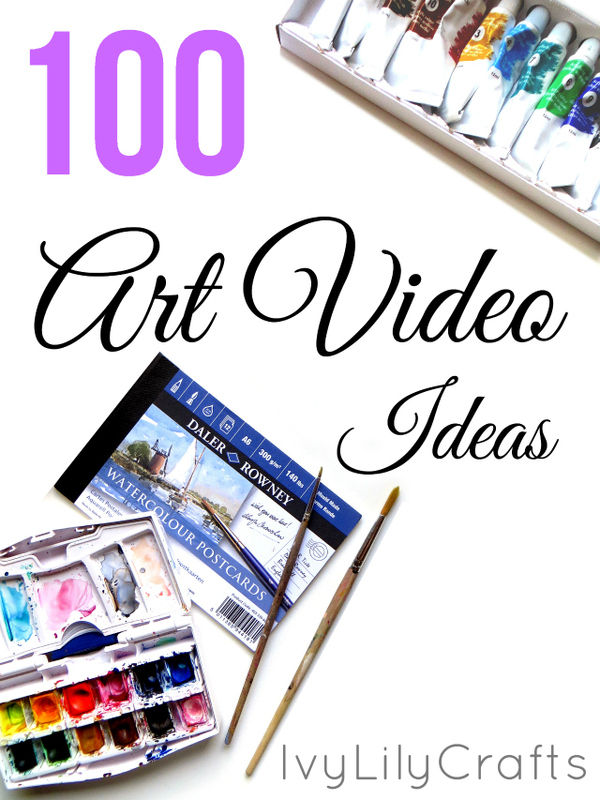 You can watch all four speed paintings in one video. 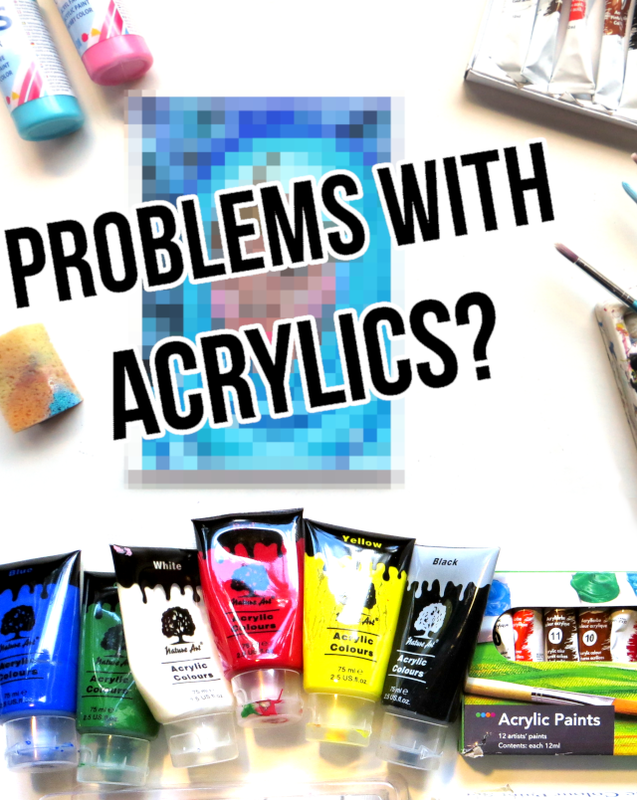 I will also make a separate video on each painting, where I talk about the materials and painting process. 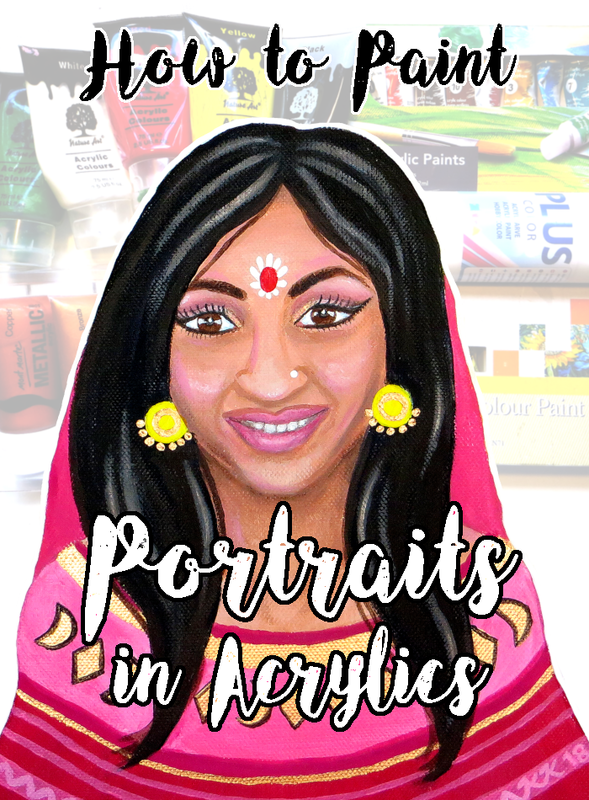 I used the grid method for sketching the portraits and transferred them onto the painting surface using graphite transfer paper. Alison played by Sasha Pieterse was painted in water soluble oils on cardboard. Emily played by Shay Mitchell was painted in acrylics on paper. Spencer played by Troian Bellisario was painted in watercolor on paper. And Hanna played by Ashley Benson was painted in watercolor on paper. When I saw the black and white episode from season 4, I thought it would be perfect for making a value study. I wanted to make soft transitions between the grey tones so I chose water mixable oils as the medium. I painted on cardboard that was primed with white acrylic gesso. After transferring the sketch I did a brown underpainting in acrylic by painting over the sketch outlines and some of the shadow areas. This seals the graphite so it won't smudge the oil paints. The lines don't have to exactly precise, the underpainting is not supposed to show through. In this case though, it does show through a bit in some places and gives the painting some warmth. I did the oil painting part in one layer over two days (it doesn't dry that fast) using only black and Zinc Titanium white. I mixed a few different shades of grey and laid down the colors using my sketch and the reference photo as guides. I blended the shades with a dry, clean brush. You can use water to dilute water mixable oil paints, but in this painting I mainly used it to clean the brushes between shades. I didn't use linseed oil this time either. 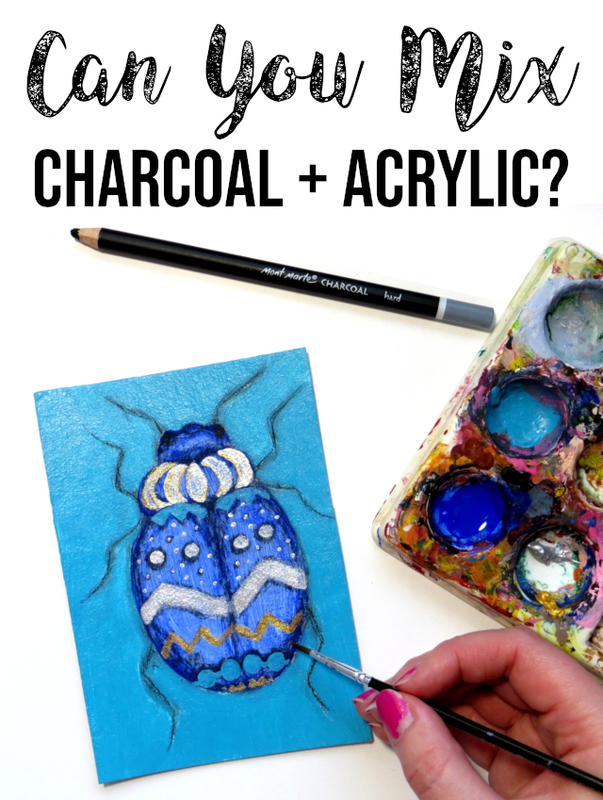 Even though you're supposed to be able to clean water mixable oil paint off of brushes with soap and water, I could not get rid of the black paint completely.